After months of rumours, Amazon has finally announced the launch of the Amazon Fire TV Stick in India. Even more exciting, the Fire TV Stick will come with the Alexa-enabled voice activated remote, something that most rumours were unsure about. The launch was announced at a press conference held in Delhi's Hyatt Regency hotel in Delhi, with Amazon Fire TV's global Vice President Marc Whitten present at the event. With the launch, India became just the fifth country in the world where Amazon has launched the device. The device has a quad-core processor and supports fast WiFi for better quality streaming. The device, a content streaming product, comes in the form of a USB stick and opens up a world of content streaming options to viewers. With the rising popularity of streaming channels like Hotstar and Netflix in India, and its own Prime Video, this is a golden opportunity for Amazon to join the party. The Fire TV Stick competes directly with the likes of Chromecast or Apple TV. “Fire TV Stick offers access to a vast selection of movies and TV shows, popular apps, and features designed specifically for customers in India including powerful voice search for Amazon Video titles in Hindi and English,” said Whitten. While rumours were circulating that the device may retail as low as Rs. 1,999 for Amazon Prime customers, this isn't the case. Instead, the Fire TV Stick with voice remote will be available starting today on the Amazon store for RS. 3,999. Early adopters will also get Rs. 499 credit on Amazon Pay as part of the offer. The device will also be available from select offline retailers like Reliance and Chroma from 20 April, 2017. 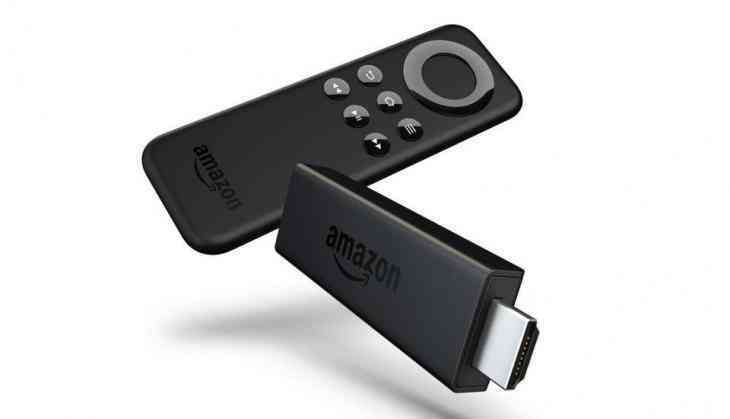 While this second generation of the Amazon Fire TV Stick was launched in October, 2016, its release in India was delayed to fine tune it to be better suited to the Indian internet situation. This includes a variety of features like Advanced Streaming and Prediction (ASAP), High Efficiency Video Codec (HEVC), and data monitoring to cope with India's comparitively more patchy internet and data limits. ASAP: Like the abbreviation suggests, the ASAP feature is meant to help video buffer as quickly as possible. This is done by studying the customer's watchlist and reccommended viewing list. Using this, the device predicts what viewers may watch next, preparing them for playback in advance. This allowing for faster streaming. Over time, predictions get better so the Fire TV Stick becomes even faster. According to Whitten, ASAP can improve the streaming time by over 50%. HEVC compatible: Given India's less-than-stellar internet, Amazon have ensured that the video quality on offer is not too heavy on your data quota. As such, the company have decided against 4K video quality, choosing instead to offer a 1080p HD experience. The HEVC codec used by the Fire TV Stick allows the device to play HEVC encoded videos, which are high quality, while being up to 50% smaller in size than non-HEVC videos of the same quality. What's more, according to Whitten, "almost 100% of the Amazon Prime Video library is HEVC encoded." Data regulation: The Fire TV Stick also allows users to manage their data consumption. The device comes with a data monitoring feature that lets users choose a preferred viewing quality to optimally manage data use. Users can also set an alert to warn them when their data usage crosses a preset limit. The device comes loaded with loads of TV series, movies, news, sports, music, and games. Content is available from providers like Amazon Prime, Hotstar, Netflix, Gaana, Eros, and NDTV. Amazon Prime Video announced 3 new pieces of video content starting today: an animated series on Baahubali, a comedy special from Kenny Sebastian, and Warner Bros.' Suicide Squad. The Fire TV Stick comes with six months of unlimited ad-free music streaming on Gaana, three months of premium video membership to Eros Now, and one month of ad-free streaming from Voot and Voot Kids. Airtel Broadband customers are also in for a data windfall as part of a limited time offer. Early adopters who use Airtel broadband and home 4G WiFi devices will receive 100GB of data for three months from the time of activation.